When you’re planning a bathroom renovation, where’s the first place you head for inspiration? We bet it’s not Bunnings, it’s Pinterest! We’ve pulled together 10 amazing Pinterest boards to follow for bathroom inspiration, so get ready to stop dreaming and start making your bathroom renovation a reality. With over 2,400 pins to browse, be prepared to be sucked down the Pinterest rabbit hole! They’ve got pins about bathrooms in all shapes and sizes to keep you drooling for hours. 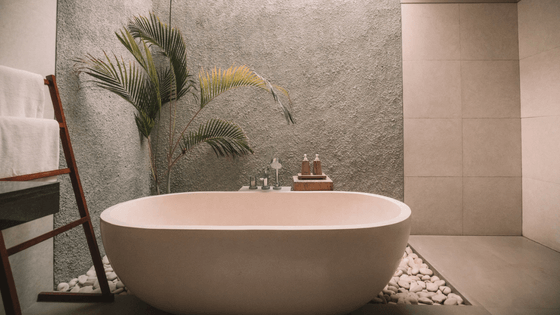 One of the top UK interiors blogger, Jen Stanbrook, has a whole heap of tips, advice and guides on bathroom design on her bathroom ideas board. For some great storage and design ideas, make sure you follow HomeBNC’s Pinterest board of bathroom ideas. From simple DIY décor ideas to gorgeous luxury bathroom inspo, the Hey There Home account is one not to miss! There are also some fab pins on the Laundry Room Ideas board if you’re thinking about a laundry renovation as well. While this board isn’t strictly bathroom related, we’re sure you won’t mind scrolling through some of Australia’s most gorgeous interiors to find some bathroom ideas that you love. It’s not called Australia’s most popular design blog for nothing! The Design Files was founded in 2008 by Melbourne stylist Lucy Feagins and their website is just as gorgeous as their Pinterest boards. Get some Aussie bathroom inspo here now! Another respected interiors blogger in Australia, the Interiors Addict is based in Sydney and has an eye for modern bathroom design, so follow this board for some modern bathroom ideas. With almost 10 million monthly views on Pinterest, the Happy Housie knows what she’s talking about. Find your perfect bathroom on her bathrooms board now. If monochrome bathrooms are your thing, this is the board for you. There are tons of ideas for simple, clean décor ideas for your bathroom here so go ahead and start pinning and planning. This board offers you bathroom, shower, sink, and bath inspiration. Emily is a blogger and editor over at Get In My Home, an Australian interiors blog which has been running for over 6 years. We couldn’t write a list of Pinterest boards to follow for bathroom inspiration without including our own account! We have boards for sinks, lighting, taps, tiles, bath mats, showers, vanities and more, so head over and get some bathroom inspo from the bathroom renovations experts in Perth now!